24 Hours in Paris – Prête-Moi Paris Style! Sometimes friends will email me and ask for advice on what to do with a long layover in Paris. Or better yet, some friends will deliberately schedule a long layover, just to get a « Paris fix » (it’s like a drug you know)! If it were me, I would certainly schedule a long layover, but I live here so I am lucky to have Paris in my life very day…even the bad days. Merci to Lucy Miller for the fabulous graphic! But I am a big fan of fun 24 hour layovers in order to get a glimpse of a city or see a friend, so I have teamed up with CitizenM hotel to bring you the best of Prête-Moi Paris in a 24 hour plan of indulgence in all things Parisian. CitizenM hotel at Paris Charles de Gaulle airport offers a fantastic place to stay. Why? Because it’s a home away from home and in between flights. Because CitizenM realizes that most people spend their time at home in the living room or the kitchen, they have created cosy homey rooms so you feel comfortable, and well…right-at-home. But that isn’t all… the offer wall to wall windows in all rooms, extra large beds, GOOD hairdryers, full length theater lighting enhanced mirrors, luxury linens, a MoodPad to control your room which is also sound-proofed… and a 24 hour available pit stop canteen. Serving signature sandwiches, salads, warm dishes and more when you want. There are also limited-edition beverages and coffee prepared by their in-house baristas. In the evening, the bar offers fine spirits, cocktails, champagne and fresh draught beer. You are no longer expected to schedule your breakfast or meals taken at the hotel around hotel serving hours. You eat when you are hungry! Ooo! And guess what?!? They have fancy schmancy shampoo and toiletries created by the same perfume designer that works for oh, Viktor & Rolf, Comme des Garçons, Helmut Lang… When in Rome Paris…. And there’s no long commute back to the airport for your early morning flight. Book it all online. And now, are you ready for your whirlwind Prête-Moi Paris 24 hours tour of Paris!?!?! 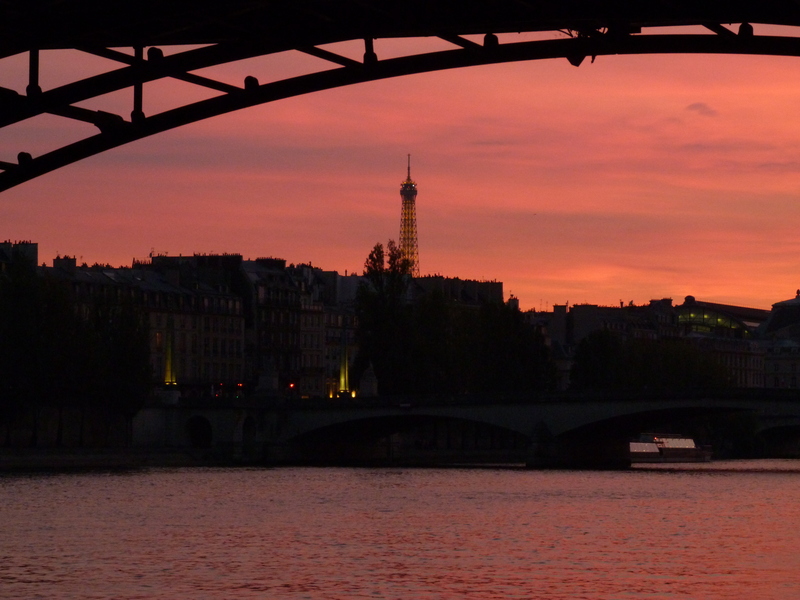 Let’s say you arrive on the overnight flight and enter Paris early in the morning. You can « hop » almost literally over to the hotel from the airporty ( Once you are at the airport, follow signs to terminal 3, take the exit 1 following the covered walkway and you will see citizenM straight ahead).Check-in and store your luggage, and grab a taxi or head back to the airport to get the public transportation into the city. First stop, breakfast : We have chosen THE place to go for all self-respecting hip, cool and trendy Parisians : Café Marlette, 51 rue des Martyrs 75009. This place is located on one of the most popular hipster streets in the 9th, so you’ll not only get great coffee and baked goods, you’ll also get an eyeful of Parisians going about their day (instead of some other place packed with tourists – you’ll go do that a little later). They also sell their pastry mixes so you can take home a souvenir of your Paris breakfast and have it again at home! After breakfest you will head up the hill and get a fast look at the Moulin Rouge and a few Instagrams too, at 82 bd de Clichy 75018. Since it’s still morning, you’ll have less tourists to battle with for a good shot that doesn’t include the heads of a lot of people you don’t want or need to know. You will continue right on up the hill (working off those morning calories) to take a good mid morning stroll around the charming area called Montmartre… Cobblestone streets where artists once frolicked (some still do), and a plethora of souvenir stores, plus grandiose views over the entire city… We think it’s a must. Hold on to your freshly bought beret, because you are going to need some energy for the next hour or two… Grab line 12 down at the bottom of the hill at the station Pigalle. Head all the way down to the station called Madeleine. Switch to line 8 and go one stop over (or walk it if you have the extra energy), or hey just taxi it all if you don’t want to hassle, but a metro right is fun and authenticly Parisian, to get to station Opéra. Opéra as in Opéra de Paris. There you ABSOLUTELY HAVE to take the tour or this famous house of dance and music, l’Opéra Garnier. It is Prête-Moi Paris’ FAVORITE monument in the entire city. And is just as stunning as Versailles, only not as big, so, much less fatiguing. Head over to 8 rue Scribe 75008 for your tour that you have reserved here. After that hour and a half of education and oggling, and counting the stroll in Montmartre, I bet you will be hungry! The perfect place to lunch to continue with your 24 hour Prête-Moi Paris marathon in the city of lights is, Café Marly, at the Louvre, 83 rue de Rivoli 75001. Café Marly for two reasons, no three : ONE, it’s got a great view (the Pyramid), TWO, they have delicious food, and THREE it’s convenient for the next stop. So sit back and relax in that comfy chair, enjoy a little foie gras, a glass of wine and a superb roast chicken lunch. Aaaaaah… it’s good to be in Paris, isn’t it! Once you have finished licking lunch off your fingers, just head over to that glass Pei pyramid to visit the French sculpture section of the Louvre. Why just this section? Because sweethearts, you do NOT have time to see the whole damn museum! And we think that the French sculpture section is the most beautiful, the less crowded and the most enriching when pressed for time. So give yourself an hour to wander around some marble masterpieces. There, you did a museum. Now you don’t have to feel guilty for any more of your indulgences!!! You’re welcome. Once you have had your fill of French art in the form of graceful sculptures, you NEED to head across the river, a little to the west and up rue des Saints Pères for the enjoyment of this charming Left Bank street aaaaaaand for a Ladurée stop, 21 rue Bonaparte 75006. I told you there would be a place packed with tourists somewhere in these 24 hours! Grab yourself a pretty little box of French macarons to nibble as you wander up the rest of the rue des Saints Pères. Here, you are in the very heart of the, très Parisian, Saint Germain des Près neighborhood. (You can stash that beret you bought). And now you are going to head over to the très French store, Hermès, at 17 rue de Sèvres for a souvenir silk scarf or tie. Admire the gorgeous architecture designs in this very modernized boutique set in a very not modern swimming pool. Yep! It used to be a swimming pool. And now it is a national monument because of the incredible tile work that Hermès preserved when they moved in. If you’re feeling really splurgy, grab a Petit h souvenir as well as a silk accessory. They are unique or almost-unique pieces, that are created by commissioned artists for the brand. And now that you are a whole lot more chic, darling, you are ready to go amongst the Parisians with your head held high. And you deserve a good drink! We suggest you head to rue Cler in the 7th, because it’s charming, trendy and full of Parisians with great cocktails and charming young servers. Try the gin cocktails at l’Eclair at 32 rue Cler, 75007. Congratulations, you have just participated in what the Parisians call « l’apéro ». And now you are starving and ready for that coveted meal you reserved (well in advance) at L’Oiseau Blanc, with the BEST view in town! Treat yourself to a taxi over to the new 5 star hotel Le Peninsula, 19 Ave Kleber. Let the lap of luxury guide you towards the elevator down the hallway laden with haute couture displays and dining areas that look like they are ready for the Queen of England. You’ll take the elevator as instructed up to the top floor… ease into your plush seat over looking the sparkling Eiffel Tower, and you will dine on the most refined French cuisine that chef Sidney Redel has invented for your pleasure. Let the sommelier advise you on wine, let the server pull out your chair when you need to get up… here service is the utmost and you are done rushing around Paris for the day. This is your cherry on top of your 24 hour Paris gâteau. Thank you! I shared your suggestions on my facebook page (https://www.facebook.com/abonjour2u). Leave a thought or two! Annuler la réponse.